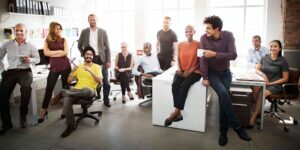 If diversity and inclusion are goals for your business, there are plenty of technology tools to help your company accomplish that objective. From blind résumé reviews to neuroscience games, these tools are designed to remove the implicit bias many of us don’t know we have such as passing up a potential employee based on his or her name. This software uses a 5-10 minute skills-based quiz to screen applicants instead of a résumé and cover letter. Potential candidates are chosen based on skills related to the job, eliminating bias based on age, gender, education, etc. Prospective employees receive one to three days to submit answers to assignments related to the job for which they’re applying. After reviewing the employer decides to continue the interviewing process. Job seekers can upload their profile to the mobile app, which blurs out irrelevant information such as name, age, photo, etc. only leaving the qualifications for the job for which they’re applying. The app also collects data to show where bias occurs. This recruiting tool uses an algorithm to search for potential employees from underrepresented groups based on skills, gender or ethnicity. The software also makes candidate profiles from varying sources. Using neuroscience games and bias-free AI, Pymetrics measures inherent traits to determine if candidates match certain job profiles. Potential employees spend about 20 minutes playing a behavior-based game, and those whose skills match the position move on to the next round.